Objective for the Day: Write more positive blog post about writing process. Four hours later: Have checked Facebook, replied to three long overdue emails, done writing practice, written part of a poem, and prepared two submissions to potential publishers. I love writing. I live to write. I do not procrastinate when it is time to write. I meet my writing goals and complete novels on schedule. I have learned discipline in editing (although there is definitely room for improvement there). I look forward to hanging out with other writers and discussing process and technique. However I struggle with classifying the overall writing process as positive. It was at first, as I churned out page after page and shared them with friends and family who seemed genuinely riveted by the story. I know – friends and family are usually just being nice. But some of them did stay up until 3:00 am finishing it and others sent threatening emails when they did not receive chapters when expected. A few of them read the whole thing twice (gladly). Either I have the best friends and family in the world (possible) or my novel was decent (equally possible?). That first year of writing was a wild and exciting ride. Probably the best year of my life. As I learned more about the publishing world, took on more and more paid work, and my volunteer life became busier, writing became more fraught – something that had to eke out a space in a cluttered environment late at night where it became more and more challenging not to throw up my hands and say what's the point anyway? And so my life has become one of duty (which just let me be clear is to excellent causes working with excellent people) while the words “screw you all” hover on my lips. Today I spent the whole day working on writing when I should have been working. I even skipped exercise class (although I will go for a run shortly). I haven’t even put dinner on so I have no idea how it is going to get cooked while I go fulfill my duties as a cub leader, then take my son to track, then go to a work meeting. Raw ribs are never a good idea. I feel marginally like I have engaged in a criminal act. Evidently, I would make a very poor criminal. So what is positive about this? I have successfully completed a small act of rebellion against my life. Maybe this will make way for more small acts of rebellion. A friend suggested I need to learn to slack more. But I am more of an all or nothing person. Either I am a writer, or I am not. Either I am a consultant, or I am not. My only vision for doing more writing is to toss a lit gasoline soaked rag into my life (well except the children and the cat of course). I was horrified to hear this week that Vincent Lam has kept his day job as a doctor. Well, if that man can’t make it is as a writer…..
Oh right. Positive. 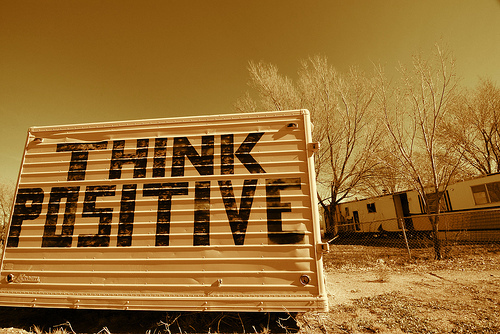 Keep it positive. Gasoline soaked rags are never positive and people start to worry if you mention them too often. Positive: Today I wrote. Now I must run. Update: It is funny looking back on this post that I wrote almost four years ago. Since writing this I have gone indie, written six novels, five short stories for anthologies and five novellas. Going indie changed so much. I still love writing, but I treat it much more like a business now. I have jettisoned the volunteer commitments and changed my life in many ways. I still work, but I am much pickier about the contracts that I take so I can still have time to write. So the truly positive, you can change your life and make space for writing!